Despite the name Bismarck Cafe, police call the saloon at Main and Winston Streets the Bucket of Blood because it’s a continual source of crime and violence. The Bismarck’s bill of fare is limited: beans, sandwiches and liquor. There is a women’s entrance in the alley off Winston that leads to one section of the cafe. 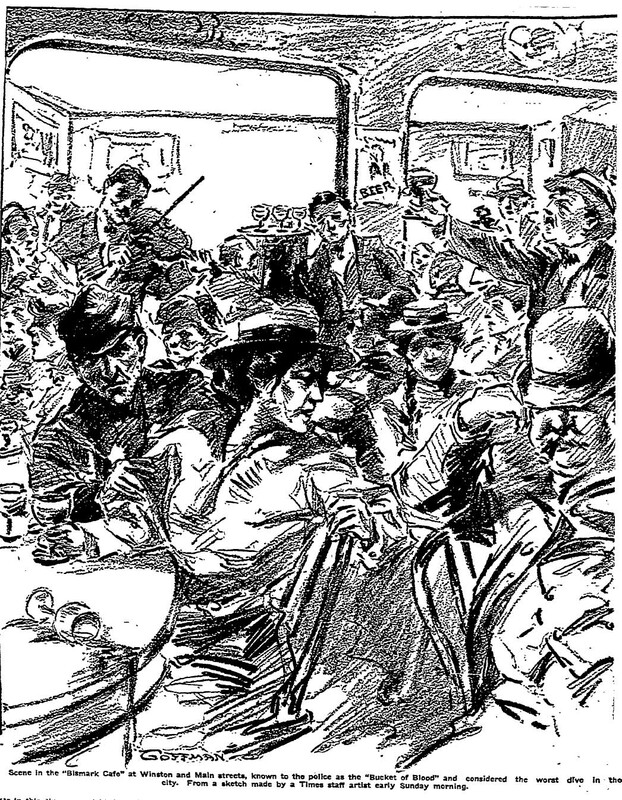 Another section features the bar, along with some tables “where men lounge around to meet some young girl or woman,” The Times says, and between the two is the bandstand. There’s sawdust on the floor, and “with an ordinary garden rake, the filth is cleaned out once a day,” The Times says. Soon, a fight broke out between two men over who was going to buy a drink for a woman. Waiters pulled the men apart, but they moved to another part of the saloon and started fighting again. One of them, J.A. Salas, pulled a gun. Police discovered that Salas and his partner Edward Wilson, had stolen the pistol in a burglary at the Hotel Marlowe, 5th Street and Main, earlier that night. Before police could take Salas away, another fight broke out in which a man threw a beer glass across the table and hit another man above the eye. The victim lunged at his assailant and overturned the table trying to get at him. Still another fight broke out between two women, their cries muffled by the music from the bandstand. A woman who is down on her luck gets her meals and drinks from cafe owner John Edwards in return for procuring young women customers. In the last 10 days, three female customers under the age of 18 had been taken to the hospital for treatment. One claimed she had been drugged by a young man, the other two had passed out. The Times tells a compelling tale, but neglects to mention a key fact: The Bismarck is a stronghold of organized labor, while the paper is staunchly anti-union. It isn’t until the next year, when Edwards was put under a boycott for firing a union bartender, that The Times began portraying him as a fearless opponent of organized labor. The Police Commission closed the Bismarck in June 1908. The address, 426 S. Main St., is currently occupied by the Blossom Restaurant. This entry was posted in 1907, 1908, Black Dahlia, Books and Authors, Crime and Courts, LAPD, Music, Streetcars. Bookmark the permalink.